3:00 p.m. Walking tour through Old Havana especially Plaza Vieja talking with artists and vendors in the Diago Gallery and in the galleries on Obispo Street about how galleries and the art market function in Cuba today. 10:00 a.m. Visit artist José Fuster in the neighborhood of Jaimanitas; his three-story home studio is surrounded by painting and ceramic sculpture, and he has now expanded his home art project to the entire Jaimanitas neighborhood. Meet with Fuster, his family, and local workers who help him on his community building projects. 8:00 p.m. Visit La Cabaña fortress for the cannon blast ceremony that recreates the traditional cannon shot of the colonial period. 10:00 a.m. Trip to the Plaza Vieja, including the Centro Provincial de Artes Visuales and the Fototeca; meet with photographers Ludmilla Velasco, Nelson Ramirez, and others, at the Fototeca to talk about contemporary photography and how it differs from that of the early 60s and 70s. 2:00 p.m. Visit to the restored ruins of Buena Vista coffee plantation founded by French immigrants. 5:00 p.m. Transfer to Viñales, ana rea declared a cultural landscape by UNESCO, and check in at Los Jazmines hotel; dinner overlooking the valley (included). 4:00 p.m. In the city of Pinar Del Rio, visit the Center for Cuban Studies humanitarian project with Down syndrome children in the printmaking workshop run by local artist Jesus Carrete. 7:00 p.m. Arrive in Havana and check into hotel; dinner on your own. 5:00 p.m. Meeting with older photographers who rose to fame in the 60s and 70s including José Figueroa, Roberto Salas, and Liborio Noval, together with younger artists who use photography and video in their conceptual work, like Mabel Poblet and Chile. "Two island peoples in the same sea of struggle and hope: Cuba and Ireland"
Irish visitors to Cuba often remark on the identification they feel with the warmth and sense of fun of ordinary Cubans. While caution is wise with such generalizations, it is a similarity that others have noticed too. There is something Celtic about the Cuban that commands the affection of those fortunate foreigners who really know them. Revealing discussions will be held with Cuban experts on the four century role of the Irish in their country’s history and culture (see below). Visits made to related historical locations in the UNESCO world heritage city of Old Havana offer opportunities to engage in discussion of pas and present. The Irish and Celtic influence outside of Havana will be the focus of field trips to the provinces of Artemisis to the west and Mayabeque and Matanzas to the east. Coincident with the Irish Heritage program is Cuba’s fifth annual Celtic Festival. 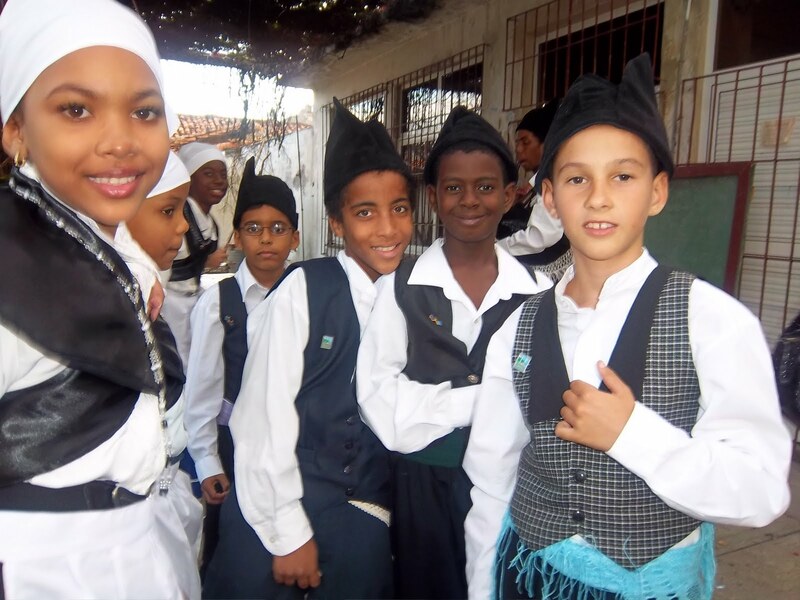 It offers direct involvement with Cuba's well-established emigrant societies from Spain's Celtic provinces of Asturia and Galicia that play a role in Cuba similar to Irish county societies in the US. With limited resources they foster a lively expression of traditional music, instruments, dance and costumes. Participants are welcomed by evening concerts into the Asturian and Galician culture. Workshops and sesiuns provide opportunities for spontaneous interaction with Cuban counterparts. 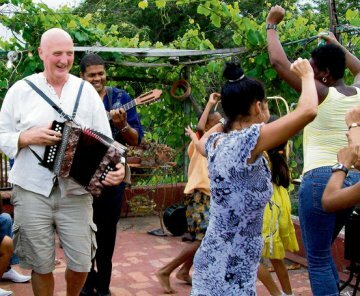 For the first time Irish American musicians, singers, dancers, academic specialists and fans can participate in a rich people to people experience, enjoying the craic while learning in the most direct and personal way possible about life in Cuba today. 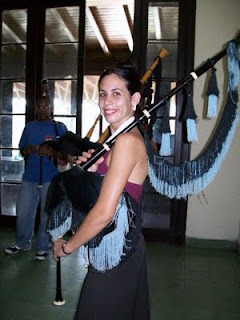 CeltFest receives the support of Culture Ireland, the Historian’s Office in Havana, Na Piobairi Uilleann (Uilleann Pipers Club of Ireland), the Irish Arts Council, and the embassy of Ireland for Mexico and Cuba. It features workshops in uilleann piping, fiddle, singing and dance, pipe and reed-making classes, informal seisiúns and concerts with performers from Ireland and Canada. from Canada the Tam O'Shanter Dancers of South Surrey/White Rock, Prince Edward Island fiddler Roy Johnstone and Cape Breton fiddlers Chrissy Crowley and Rosie MacKenzie. Among the Cuban performers have been Artistica Gallega Pipe Band, Asturian Pipe Band, Aires Galegos De La Habana, Asturian Folk Group "Resurrectio" of Pinar Del Rio, Band and Dancers of Monterroso y Antas de Ulla, Havana's Galician Dancers "Grupo de baile de la Sociedad Agrupación Artística Gallega de La Habana", and the symphonic prog rock band Anima Mundi with Galician bagpipes, the Celtic flute and the tin whistle. There will also be opportunities to meet Cubans active in other aspects of the country’s music and dance, including conversation with students and professors at the Instituto Superior de Artes (ISA) , and meeting performers of Opera de la Calle (Opera of the Street), and potential evening encounters with salsa, jazz and Buena Vista Social Club style musicians. The Irish Heritage Program is a people to people trip sponsored by the Fund for Reconciliation and Development. It is coordinated by John McAuliff, formerly President of the Philadelphia Ceili Group and Assistant Editor of the Irish Edition. He has traveled frequently to Cuba since 1997. For further information about the program and cost, and to obtain a registration form, contact director@ffrd.org or call 914-231-6270. The first report of Irish in Cuba dates to 1609 and speculates they were employed as sailors. Irish people served at high levels in government and in senior military positions. The lighthouse at El Morro, the fort that guarded Havana Bay, had been known as "O'Donnell's Lighthouse", after the Spanish governor, a relative of Red Hugh O'Donnell. The O'Farrill family came from Longford via Montserrat. They rose to prominence as slave traders, importers and sugar plantation owners. The family mansion has been restored as a beautiful boutique hotel. O’Reilly Street was named after General Count Alejandro O’Reilly, a native of Baltrasna, County Meath. He organized the black and mulatto militias and the defenses of Havana in 1763. Juan O’Bourke, who was born in Trinidad around 1826 and twenty-five years later took part in the armed uprising of July 1826 organised by Isidoro Armenteros, collaborator of the expansionist general Narciso López, lived in this city [Cienfuegos] from 1839. The young revolutionary Juan O’Bourke was arrested and later condemned to ten years in prison in Ceuta from whence he escaped and headed to the United States…. “The Junta de Fomento brought the technicians, foremen, superintendents and a group of workers made up of 273 men and 8 women from the United States under contract, among whom were English, Irish, Scottish, North American, Dutch and German labourers. However, they were all identified as Irish, perhaps due to the greater numbers of those of that nationality. Other Irish coming via the US to Cuba found a smoother path. “It has been said that the introduction of the steam engine and other improvements in the sugar industry, Cuba’s main economic activity in that period, was mainly the work of North American growers who had settled on the island, particularly in the areas surrounding Matanzas and Cárdenas, north coast districts which, according to the opinion of the Irish writer Richard R. Madden, had more characteristics in common with North American towns than those of Spain. “Some of these foreign technicians living in the Matanzas region became involved in a legal trial, accused of complicity with the enslaved African people’s plans for a revolt, which were abandoned in 1844. Six of them were originally from England, Ireland and Scotland: Enrique Elkins, Daniel Downing, Fernando Klever, Robert Hiton, Samuel Hurrit and Thomas Betlin. While documentation is not conclusive, the grandfather of Ireland’s independence leader and President is said to have been Cuban, active in the sugar trade in Matanzas Province. Juan Manuel de Valera reportedly sent his son Vivion Juan, an aspiring sculptor and music teacher, to New York to avoid the Spanish draft. He married Catherine Coll from Bruree, County Limerick. Their son Eamon de Valera was born in 1882 and sent to Ireland to live with his mother’s family after his father’s death from illness in 1885. Cuba's iconic revolutionary Che Guevara was from Argentina but his grandmother Anna Lynch hailed from County Galway. Among contemporary Irish links in Cuba are monuments in public parks to the ten deceased hunger strikers and John Lennon of the Beatles. 5) San Patricio farm in Limonar owned by George and Mary Gowen from Boston. * Alameda de Paula. A part of it is known as O'Donnel Hall. Charles Blakeley, also from Charleston. surgeon dentist with an official licence in Cuba. O'Farrill's lands. Its church was also built with the aid of this family. Therese Holmes y Walsh, member of a revolutionary Irish family. * Limonar. South of Cárdenas. (x) Two coffee estates named San Patricio (St.
Robert Blakeley, from Savannah, Georgia. $300 scholarships for December 7th-16th Sustainable Urban Agriculture Group. We are grateful to have this potential for qualified travelers. the time line is tight. if you are able too take advantage let us know ASAP. Sustainable Agriculture, Agroecology & Culinary delegation – Seed to Plate hosted by mentor & partner Dr. Fernando Funes, the founder of the movement in Cuba responsible for creation of 33,000 urban farms, 480,000 resultant jobs, the UBPC system and the International Conference held each year. Delegates are also led by Founder of NEEM, a Durham OFAC licensed People to People Exchange organization – neem@mindspring for sign up. Delegates arrive in Miami and meet at ticket counter. RT air from Miami, visa, health insurance, ground, classes, drivers, presenters, interpreters, breakfast and lunch, celebration dinner included. All expenses on island except dinners, gratuities and spending money is provided. Delegates need $25 CUC departure tax. Neem is a tree, an answer to global issues. NEEM is a organization in Durham that replicates the Cuban model. Organoponico NEEM is a cooperative 14.6 acre Agroecological urban farm in Durham. HAVANA TIMES — Miami has been in an uproar ever since the US Treasury Department´s Office of Foreign Assets Control (OFAC) resumed granting licenses to American citizens who want to visit Cuba in compliance with the policies of the “People to People Contacts Program”. According to protests by some spokespeople of the exile community, those trips blend tourism with indoctrination. Nevertheless they don’t explain what the consequences of such ideological penetration by Cuban communists would be for the national security of the USA. Among the most serious proof they mention were the presence of a group of US citizens who took part in a concert for Fidel’s birthday and a meeting between Americans and Raul Castro’s daughter, Mariela, a known a defender of the rights of the LGBT community in Cuba. It’s curious that they fear the indoctrination of their tourists and at the same time assure people that Cuba is sunk in the most miserable quagmire and that most Cubans are discontent. Those who come from a country with opportunities and freedom shouldn’t have anything to fear. What’s happens is that the problems of the island are exaggerated so much that when one comes into contact with reality, people discover they’ve been deceived. Cuba isn’t the paradise on earth that its national press paints for us, but nor is it the nightmarish hell those in Miami describe it to be either. If the media and political activists in exile really believed what they tell us about the island, they themselves would promote trips from the US to Cuba so people could see with their own eyes what is happening there and then spread this information across the entire United States. Also, there are barely 10,000 Americans who travel to the island every year with special licenses approved by their government. Although they lose themselves among the 2.5 million other tourists who visit Cuba yearly, I occasionally run into some of these people walking through Old Havana. Picking them out isn’t difficult; they’re the only travelers who move through the city in groups and with their credentials hanging from their necks, like we journalists do when we work. I sometimes wonder what they do with those things when they go swimming at the beach. But those restrictions aren’t imposed on them by the “Cuban indoctrinators.” According to John McAuliff, from the Fund for Reconciliation and Development, OFAC is the one that insists on full-time structured programs instead of trusting the Americans to go, explore and see things for themselves. In the end, with so many regulations from Washington, these Americans who visit Cuba greatly resemble the stereotyped image of Japanese tourists wandering the streets in groups, weighed down with cameras and snapping photos in all directions. In Miami they criticize American tourists to Cuba because they drink mojitos and dance salsa, but I really haven’t been able to come up with a better way to come into contact with the Cuban people, relating to folks in the streets, in bars, discos and even in tourist hotels – where 400,000 Cubans who live in Cuba spend their vacations each year. That was the plan, but I don’t imagine that these tourists — with their clueless looks, flowered shirts, Panama hats and sandals, and who walk along with sunburnt skin languishing under the heat — are engaged in very much political proselytizing, through their translators, trying to get Cubans to reverse the revolution. It seems that George W. Bush realized the limits of that strategy and put an end to licenses for US citizens. He even cut the mojitos and salsa enjoyed by the Cubans from Miami, reducing their trips to the island from once every year down to once every three years. He had to demonstrate that they were politically persecuted. The US Republican presidential candidate Mitt Romney — advised by Senator Marco Rubio and Congress members Mario Diaz Balart, David Rivera and Ileana Ros — promises that if he’s elected president, he will prohibit trips to the island and suspend the sending of family remittances. But since he has yet to be elected, hundreds of thousands of Cuban-Americans continue traveling to the island every year, with them now having become the second largest group of visitors, behind the one million Canadian vacationers who go their annually. Many of the Cuban-Americans even have their airfare paid in exchange for bringing merchandise to sell in Cuba. The Cuban American congress members are pressuring Washington to maintain the embargo while those who emigrated send more than one billion dollars in remittances to Cuba annually. Similarly, these legislators lobby against trips by US citizens to the island while exiles visit the island in mass. It’s truly an upside down world! (*) An authorized HT translation of the original published by BBC Mundo.